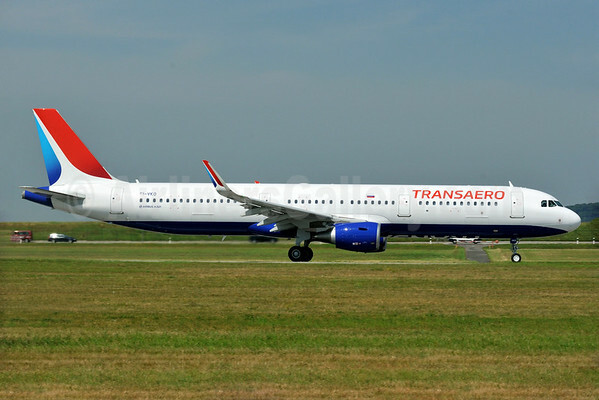 Transaero Airlines (Moscow) has taken delivery of its first Airbus A321. The company is planning to introduce the new type on routes from Moscow to Paris, Tel Aviv, Astana, Almaty and Novosibirsk. Transaero Airlines on July 28 received delivery of its first Airbus A321 as a result of a long-term leasing agreement between the airline and ICBC Leasing of China. The delivery from Airbus’s Hamburg plant is part of Transaero’s fleet renewal program and business efficiency enhancement program. Under this program, Transaero’s fleet is being expanded with new fuel efficient aircraft with optimal passenger capacity for the current market conditions. By the end of the year, Transaero plans to receive three more A321 aircraft. The A321 is the first Airbus medium-range aircraft in the airline’s fleet. It is configured with two classes and can accommodate 184 passengers. The Business class cabin has eight highly comfortable seats with a seat pitch of 55 inches. The Economy class cabin has 176 ergonomic B/E Aerospace slimline seats. The seat pitch is 31 inches. The aircraft is fitted with sharklets. Its passenger cabin is equipped with LED lighting. The seats are fitted with power and USB sockets. The A321 was delivered in a new corporate identity, which the airline uses for all new aircraft joining its fleet. Transaero will start operating its first A321s on the high-demand, medium-range routes, i.e. to Paris, Tel Aviv, Astana, Almaty and Novosibirsk. Copyright Photo: Gerd Beilfuss/AirlinersGallery.com. Transaero Airlines’ first Airbus A321-211 registered as EI-VKO (msn 6678) taxies at Hamburg (Finkenwerder) before the handover. This entry was posted in Transaero Airlines and tagged 6678, A321, A321-200, A321-211, Airbus, Airbus A321, Airbus A321-200, EI-VKO, Transaero Airlines on July 29, 2015 by Bruce Drum.